Sorry for my extended absence. I’m really not worthy of your audience. I’ve been swamped with work and life. Maybe I can make it up by sharing a a recipe with you. Two weeks ago, neighbors of mine celebrated their 40th wedding anniversary. Their children, some of whom I had grown up with, were all flying in to surprise their parents with a weekend of eating and catching up. I volunteered to bake the cakes; 5 layered cakes for 40 guests. (You can see all of the cakes and food on my flickr). With so many cake recipes, it was hard for me to decide on which ones to make. I ended up selecting a couple of my favorites along with some new cakes I’d been wanting to try. 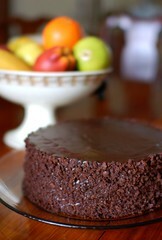 “That Chocolate Cake” is from the Scharffen Berger “The Essence of Chocolate” cookbook. It’s moist, it’s fluffy, it’s rich, it’s dark, it’s velvety, it’s luscious, and it’s sinful. It’s so many things, and yet, really, it is just that chocolate cake. 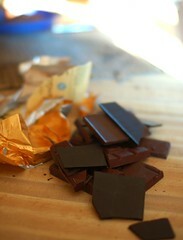 The frosting is essentially a dark chocolate ganache made from 99% chocolate, butter, cream and sugar. Not surprisingly, it was the first cake to go. 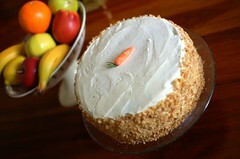 I rarely eat carrot cake. 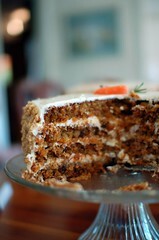 But, I *love* the carrot cake recipe from the Gourmet Cookbook (edited by Ruth Reichl). Make the Cake: Put a rack in middle of oven and prheat oven to 350F. Butter and flour cake pans, knocking out excess flour. 1. Shred enough carrots on smallest teardrop holes of box grater or with fine shredding disk ina food processor to measure 2 cups. 2. Sift together flour, baking powder, baking soda, salt and cinnamon into a large bowl. Stir in sugar, oil, eggs, carrots, pineapple, coconut, walnuts and raisins (if using). 3. Divide batter between cake pans and bake until a wooden pick or skewer inserted in center of cakes comes out clean, 35 to 45 minutes. Cool layers in pans on a rack for 5 minutes, then run a thin knife around edge of each pan and invert layers onto rack to cool completely. Make the Frosting: Beat together cream cheese, butter, and vanilla in a large bowl with an electric mixer at medium-high speed until fluffy about 2 minutes. Reduce speed to medium, add confectioners’ sugar, and beat until frosting is smooth. Place 1 cake layer bottom side up on a cake plate and spread with some of frosting. Place remaining cake layer right side up on top and spread remaining frosting over top and sides of cake. – The cake layers can be made up to 1 day ahead and kept, well-wrapped in plastic wrap, at room tempurature. – The frosting can be made up 1 day ahead and refrigerated, covered. Bring to room temperature, then beat with an electric mixer at medium speed until smooth before frosting cake. Perhaps a more “challenging” cake for the common palate, but one of my favorites, is the Rosemary and Olive Oil Cake from the Babbo Cookbook. I decided to offer a non-traditional cake, and no one seemed to bat an eyelash at the foreigner. 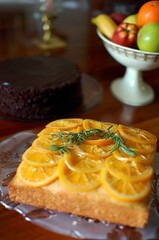 I blogged about this cake upthread and posted the recipe (see “rosemary and olive oil’s baby…“). This time, instead of baking it a loaf pan, I put in a square cake pan and adjusted the time. To jazz it up, I layered the cake (you can’t see the seam, thankfully) with orange marmelade and candied some orange slices (basically making a heavy simple syrup and boiling thinly sliced orange wedges in it until the rinds go translucent) for a top garnish. I used the syrup from the orange candying process to moisten the layers of the cake while assembling it. Lastly, I also made the Pecan Spice Cake (pictured at the very beginning of this post) from the April, 2007 issue of Gourmet. 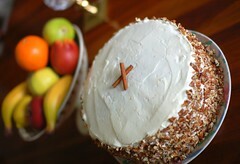 I also blogged about this cake and posted the recipe in a previous posting (see “they should pay me…“). The only change I made to the cake this time was that I spiked the cream cheese frosting with a just a touch of spiced rum. ~ by ulterior epicure on June 26, 2007. This a beautiful display… It must have taken you days to do all this! Talk about the law of attraction in action. It seems that my Carrot Cake recipe has taken on a life of it’s own since being published in the June 1990 edition of Gourmet Magazine and then in the compilation volume in 2004. I feel like I am on What’s my Line–I am Felix Papadakis. I live in Erwinna, Pennsylvania and let me share this very bizarre tale. Just last night I was searching for the original issue of Gourmet (June 1990) in which the Carrot Cake recipe was published. I was then living in Hoboken, NJ and studying for the bar exam and vividly recall my late aunt, who is featured on the first entry of my blog felixpapadakis.wordpress.com, calling me to tell me that she spotted my name in Gourmet. I had secretly submitted the recipe to Gourmet months earlier and after a call from the test kitchens of Gourmet–who knows, maybe it was even Sarah Moulton who called me–I was told the recipe would appear sometime in the next few months. Fast forward 17 years to yesterday. Searching in the darkness of our basement to no success, I could not believe that I had misplaced my 15 minutes of fame. So, last night I ordered the entire year of 1990 on Ebay and this morning, thinking that I would maybe need a few more copies for posterity, I googled Felix Papadakis Gourmet 1990 and was led to your blog. I’ve always believe in the power of food to bring people together and here we are. Great blog. Love the layout and the pics. Continued successes. Broomal PA the ladies of philoptochos gather and bake for our Greek festival. I offered to bring Carrot Cake today. Yesterday I took the recipy out and noticed the Padakis name! Yesterday also the President of Drexell U. also Papadakis has died. It is odd…..The ladies loved the Carrot Cake. I read somewhere to pay attention to the signs… Just wanted to share this with you. 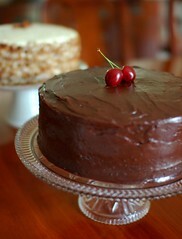 Oh my your cakes look fabulous :) Love the photography style too.